It is the harmful effects of UV light that degrade the bitumen/asphalt content. It is this content that binds the aggregate [stones] together. The first signs of degradation is the fading of the colour as the binding properties are reduced, followed by the aggregate becoming loose. By letting POWER WASH clean, seal and restore your tarmac you would be choosing a cost effective alternative to the replacement of a driveway. 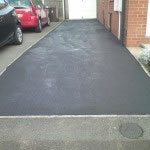 Power Wash offer tarmac cleaning & tarmac restoration in Wigan, Warrington, Saint Helens, St. Helens, Leigh, Bolton, Prescot, Manchester, Liverpool, Cheshire, Merseyside, Lancashire and Greater Manchester.